Students were well into a Project Based Learning (PBL) unit on ancient Egypt when someone on the medical team stated, "A lung is missing!" The said lung was to go into a canopic jar and accompany “King Cluck” and “Servant Steve” into the afterlife and my 70 students voted unanimously that they would not send them without it! Wickedly late, I received a call from one of my students, “Ms. R! My dog killed a bird! Shall I bring him to school? !” We held an emergency meeting and the students rejoiced at the fact there was a donor lung! This is just one example of how PBL can engage, enlighten, and excite students to learn. Click here for student interviews that showcase some of our PBL's..
With this workshop, teachers and administrators will learn how to teach PBL which is a dynamic approach to teaching in which students explore real-world complications and challenges, cover up to 50 Common Core Standards per unit, and come up with authentic realizations and answers. Through PBL, students are unconsciously immersed in 21st-century skills while embodying altruism. In addition, PBL creates students that are more motivated, involved, and inspired to obtain understanding of the subjects they are studying. This is when connections are made. This is when real learning occurs! Some of the PBL's are explained below. presents at SJSU at the Student Success Center (room 106) at Sweeney Hall! "Social Justice: Be the Change!" Essential Question: "How do social injustices affect us and how can I contribute to greater social justice?" Motivation: In 2014, via the Umbrella movement, the people of Hong Kong protested the intrusion and force of the Chinese government on their own political process. As the people fought for their right to continue democracy, the Chinese government stood strong and prevailed. After witnessing this, it became apparent that our students should not only know about global oppression, but to appreciate and cherish the rights we have as Americans. The purpose behind the Social Justice unit is to give the learners a global and historical perspective of social injustices such as racial intolerance, censorship, stereotypes, and social needs. Learners use rhetoric to create an authentic argument for change, develop that rhetoric into an action plan and conduct a group service project. Like with the other PBL's, students improve over 50 Common Core Standards of reading, writing, speaking, listening, and language skills through research, presentations, citing, and note taking which culminate in an argumentative essay. For end products, click on the links below. Moreland School District Board Presentation : Watch until 7:43 and if you have time, watch "Team Afghantisan's" bloopers. I had to put that in there. If not, navigate to 9:41 to continue watching their professionalism. "9/11: We Could be Heroes!" "We are the World: An Inconvenient Truth"
Essential Question: "How can you turn a negative into a positive?" Motivation: When asked what happened on 9/11, only a quarter of my students knew that something bad occurred but were not sure what, while the rest did not know the day was significant. After being asked to be the keynote speaker for my graduating class of teachers because of a small PBL related to 9/11, the day has always held a sacred place in my heart. As teachers, we have the opportunity to guide our young people to realize local and global avenues for change and that they too can be heroes. 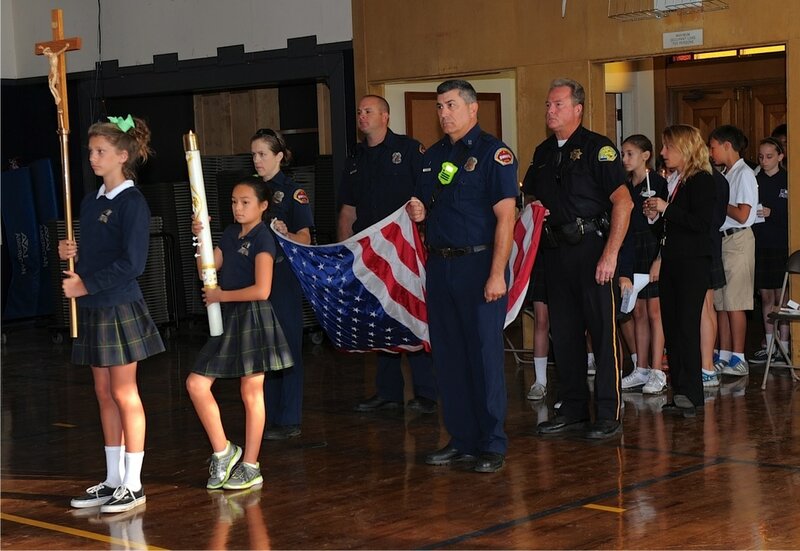 Students learn that a big part of the response to the terror attacks of 9/11 was a spirit of unity, perseverance and a resolve to overcome by fostering a spirit of community activism worldwide by celebrating heroes through poems and song. For incredible lesson toolkits, please visit the 9/11 Tribute Center and 9/11 Memorial.org. Motivation: Climate change is a quintessential public-policy issue as are the number of endangered species in the world and not only is understanding the science crucial, but so are the economics. When it comes to solutions, each of us has different ideas on what needs to be done depending on what we believe is the cause of those problems. Such ideas are based upon our limited perception of the world which is colored by our education, country of origin, and ultimately by our level of consciousness. They become beliefs that shape our experience of this world and determine our actions and eventually our destiny. After this two-month PBL, students write global dignitaries offering solutions to the topic they chose and have received letters from leaders such as the governor of Florida, President Obama, and even the US Ambassador to Indonesia! Students created poems that were sent to firefighters of the FDNY Ladder Company 3, the station with the most casualties on 9/11. Poems were also sent to counties in California with fire devastation. Then there were the student-produced Career Fairs with over 400 middle and high school students in attendance! Click here for 2016 and here for 2015!